On Oct. 24 IOP director David Axelrod (left) discusses the 2016 presidential election with John Weaver (center), chief strategist for John Kasich’s presidential campaign, and Glenn Thrush (right), chief White House political correspondent. David Axelrod sat down Monday to discuss the 2016 election with John Weaver, the chief strategist behind John McCain and John Kasich’s presidential campaigns, and Glenn Thrush, Politico’s chief political correspondent. 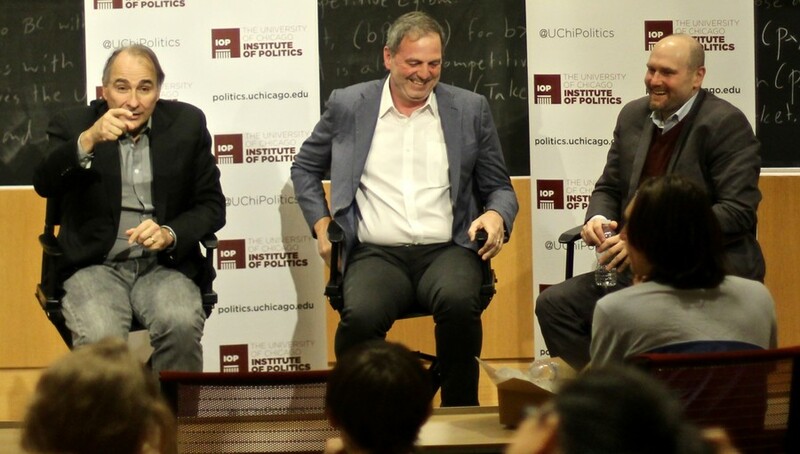 The event, a latest in Axelrod’s Decoding 2016 series, was hosted by the Institute of Politics at the University of Chicago and took place at Saieh Hall. With the final Presidential debate behind us and the election only fifteen days away, Axelrod centered Monday’s dialogue on three questions: where we have been, where we are now, and where we might go after November 8. Axelrod began with the observation that the more moderate Republican candidates in recent decades, represented by Weaver’s clients, have largely failed in their attempts to appeal to a general electorate. Axelrod asked his guests if there still is a market within the Republican Party for moderates. “Not at this point,” Thrush replied decidedly. In his view, the political landscape that underlies the current election is characterized by fragmentation. Thrush listed gerrymandering in Congressional districts and profit-oriented media outlets as major factors that are precluding the possibility of consensus. Where compromise is a sellout, moderates stand no chance. The conversation then turned to predictions for the nearing election. Both Weaver and Thrush agreed that a Clinton victory is a certainty. “She will be somewhere North of 300 [electoral votes],” Thrush said. "Weaver predicted a landslide for Clinton, one that would surpass President Obama’s margins of victory in both 2008 and 2012. The precarious position of Republican candidate Donald Trump is equally glaring. When asked about his likely performance in Texas, a traditionally secure Republican state, Weaver predicted a mere two to three point margin of victory. Previous Republican candidates have generally performed far stronger. McCain won the state by 12 points against Obama in 2008, and Romney by 16 in 2012. On down-ballot implications, Axelrod predicted that it would be almost impossible for Democrats to take back the House of Representatives, as they would need more seats than the number of competitive races available. With regard to Senate races, Thrush believed that the resilience displayed by Republican Senatorial candidates thus far in face of polarizing controversies could wither away when Trump is overwhelmingly defeated. What should we expect for the future? For one, Clinton faces a difficult path ahead. “She will be the most unpopular president elected in history,” Weaver said. She must confront, among others, doubts on her trustworthiness, contention over her free trade position, and the lingering specter of Trump. More adversaries exist. Russian President Putin has already demonstrated his disruptive prowess in this election cycle. On WikiLeaks and Putin, Weaver warned that what Putin wants is not to support Trump, but to instill in American citizens a profound doubt on their own democracy. Weaver also repeatedly claimed that an “existential crisis” is gripping the Republican Party. The road ahead will evidently be difficult, and not only for Clinton and the Democrats.